This project represents a radical break from my usual fare of traditional hot rods, customs and drag racing subjects. I suspect that among those who know me this may come somewhat as a shock. So an explanation is in order. 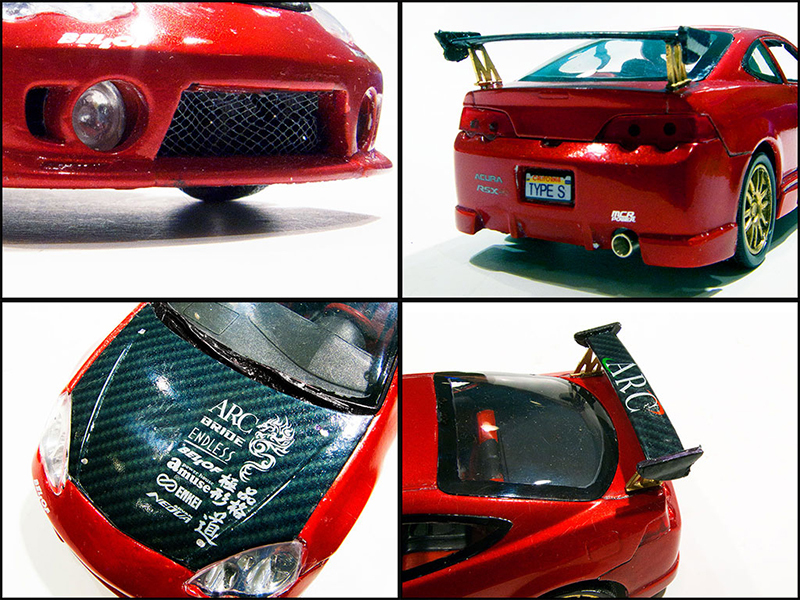 What would motivate me to build a tuner import? Well, to begin with I’ve always liked the concept and have admired many a well-turned-out ricer in my day. Back in the late 90’s when I was planning a streetable sports car for my driving pleasure I briefly considered a supercharged Series 1 MR2, but eventually built a hopped up Frogeye Sprite complete with tilt nose, 1380 cc motor and 5-speed instead. In a sense that was a kind of retro rice rocket in its way. So anyway, at this year’s NNL West I fell for an Aoshima Pagani Huayra. Once I had time to contemplate that highly detailed and totally contemporary kit I realized this was a style of build that I would have to work up to. I’ve always loved sports cars and road racers but as kits these “moderns” are engineered quite differently from my usual diet of ancient 60’s era AMT, Monogram and Revell kits. I wondered if I might have something contemporary in my stash that I could use to hone my skills. 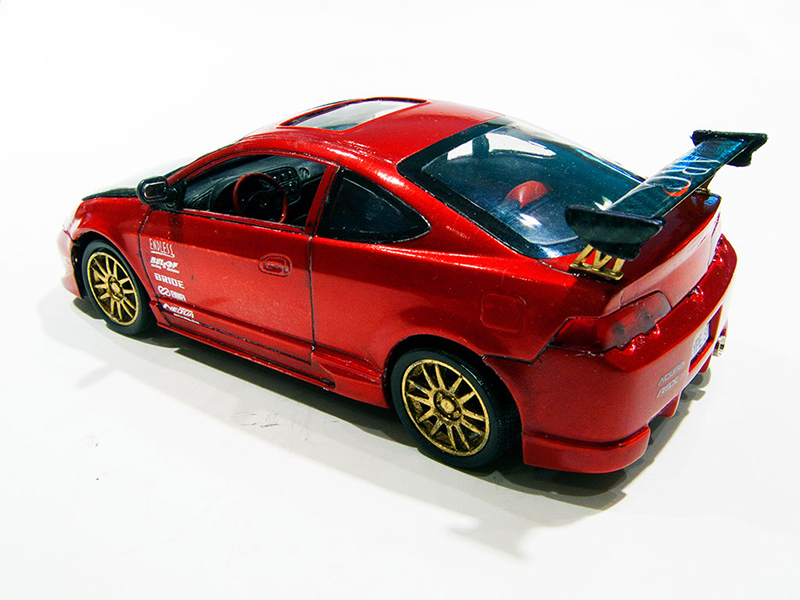 It turned out that I had a Revell Acura RSX Type S tuner kit in stash which I had won as a door prize many moons ago at an IPMS show. It’s actual an extremely well-engineered and thoroughly modern kit, with lots of tuner bodywork options and many of quite highly detailed. Not really in the same league as the mega-parts-count Aoshima Pagani, but the basic approach is fairly similar. I thought it would a good start in getting into this style of modeling. Of course I couldn’t resist making some changes to the bodywork much as I would have with one of my -hot rod projects. In this case I filled the v-shaped indentation on one of the 2 tuner-style custom noses that come in the kit (red area in the picture below), and also cut out the filled in grilled opening and installed some mesh to allow the radiator to show through. The radiator itself is finished in aluminum paint and a home –made decal of an ARC Brazing, Ltd. logo (they make radiators, intercoolers, intakes and exhausts for the tuner and drift world). Other than that the build is largely out-of-the box. 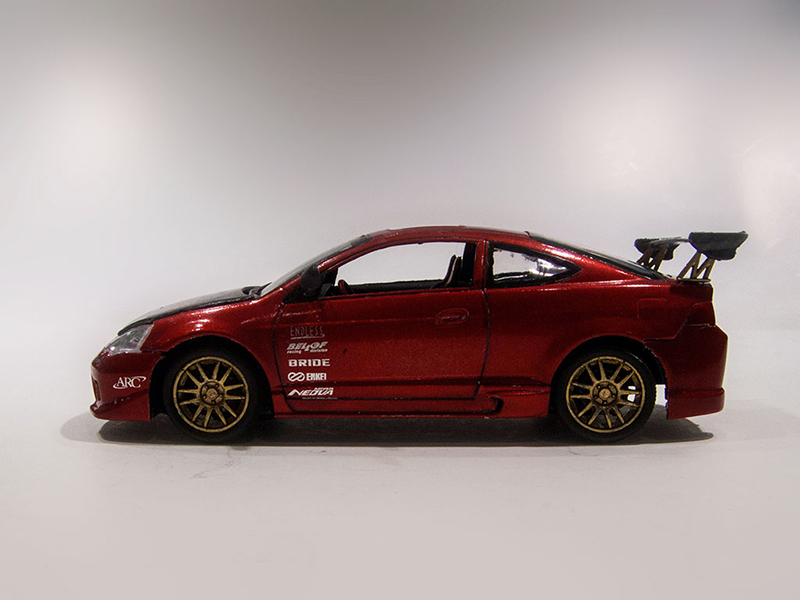 The body is painted in Duplicolor Toreador Red Metallic paint with the rear wing and stock hood finished in home-made carbon fiber decals which include decorative decal motifs. 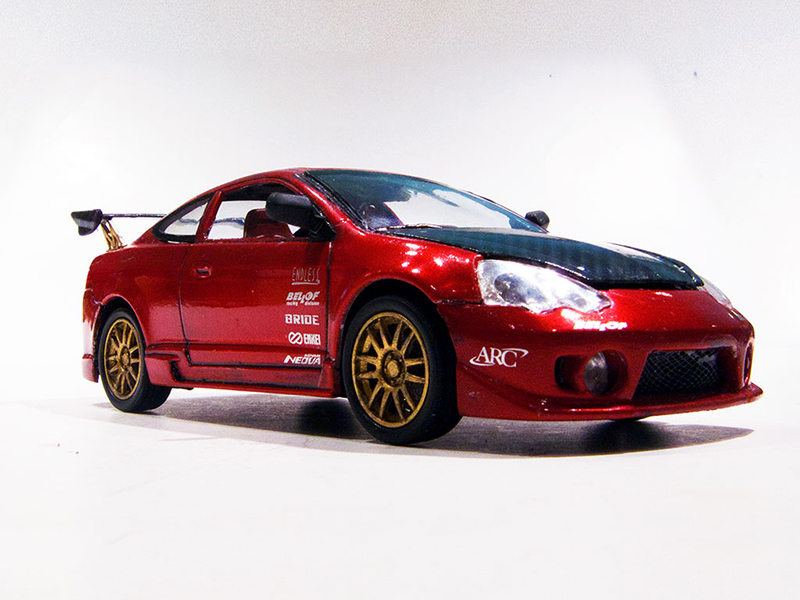 The rear wing repeats the ARC logo and on the front I repeat the sponsor decals arrayed across the leading edge of the doors along with a dragon figure and the phrase “Tao of Acura RSX” in kanji characters. The various silver JDM style hop up parts logos on the bodywork are from a Hobby Design JDM sheet I bought. The quality is absolutely first rate. Everything is sealed under Duplicolor Clear, and once it’s properly cured I will give it a good polish. The interior is straight from the kit and detailed out in red pseudo leatherette (Testors Flat Red Acrylic) and matte black (Duplicolor Black Primer). The same is true of the motor which is detailed out in various shades of Testors Metalizers. The wheels one of the two kit optional tuner wheel sets, finished in Testors Metalizer Brass. Still left to do is the glass work, which on these modern cars requires a good deal of detailing, and then final assembly. I'll admit I was a little surprised to see you building a tuner! But it's good to step outside of the box occasionally! It's not what I usually build as well. I like what you've done so far. Nice paint and details! Hi, Bernard! I almost missed this one due to the subject line. Not your usual topic so I cruised right by. Glad I stopped to check it out. Beautiful work, as always. I pretty much lost interest in the sports car theme after Bridgehampton Race Circuit closed up. Lately the imports don't interest me that much except for a few local rides like LS-powered Mazdas and the like. However, I don't need to have a personal interest in a subject to be able to appreciate the craftsmanship involved. This project is now completed! Lots of new things to watch out for, like cleanly gluing surface mounted windows and trimming them out with their black surrounds – basic stuff for modern cars but a brave new world for this modeler whose subjects have never seen the far side of the 1960’s! 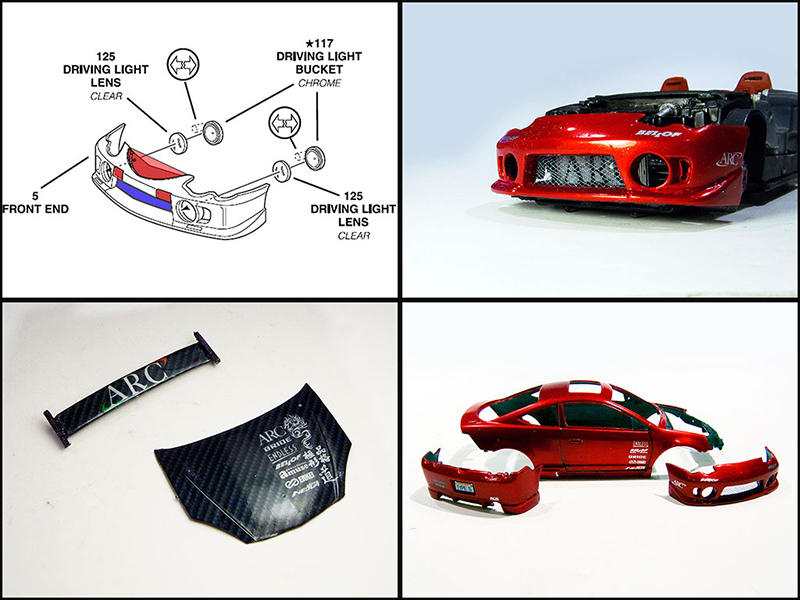 This kit was well engineered and the parts fit excellent so there were no technical challenges that weren’t inherent in the way contemporary cars go together. I had thought about modifying the stance but the way the suspension was constructed in this kit gave me pause – it was unfamiliar territory and I thought I’d wait for another swing at a contemporary car before I start fooling around with stance. Overall an uneventful and interesting build working in a subject area that, when it comes to doing things in scale, was a brave new world for me. Below is a summary photo showing the final details as they appear on the completed model. I’ll post the final beauty pics in the next day or so. Here are the final "beauty shots". Looks fantastic Bernard . Detailed very well & the gold wheels suits the dark red perfectly . Nice end result, as usual, Bernard. The more I am exposed to the tuners, the more willing I am to accept them into my brain. I have come to understand the technical aspects of the modern electronics and turbos. In fact, I'm glad to see that technology applied to the "Street Outlaws"-type cars. Obviously more power available than in "the old days". I still prefer the earlier iron for the "personality" rather than the "cookie-cutter" current day cars but that's just a product of my own youth and obviously todays young drivers feel the same about their late-model rides. Thanks for taking us along on this "detour" and hope to see you back in familiar territory soon! Thanks so much to both of you. The Tuners were most recent wave of truly different hop up and customizing trends. I always have admired them for this, and done well, as in all forms of expression, they can be truly impressive. Back around 2000 I was starting a 1:1 hop up project. I initially considered going the tuner route, either doing a Honda coupe or perhaps restoring and modifyinh a Series 1 Toyota MR2 in the Supercharged version. In the end I did a body-off Bugeye (Frogeye) Sprite Mk.I with a 5 spd. gearbox and 1348cc 116 bhp motor and all-steel flip-forward nose. A very cool car but not very practical. At times I have thought going the Tuner route, particularly the supercharged MR2, would have been a more generally useful approach to high performance. I'd still prefer the Bugeye, but that's just me. Of course, I credit my bias to a local street hero in the late sixties with a Bugeye Sprite with a 2-barrel 289 Ford and C4 automatic and Ford rear. I can still picture in my mind the side pipes, small hood scoop, trailer fenders covering the rear tires and chartreuse Metalflake paint. Psychedelic Sixties, indeed! Not very practical, either, but who cared? Very nicely done, that turned out great! Something is wrong here. B. has built a tuner? Can't be! Kidding aside, this is one of your cleaner builds B.! Everything works and has a clean and tidy look to it. Well done! Sometimes building out of your normal can be a great thing. It brings new life to your hobby. Everything is new and fun again. I get burnt out doing the same type of models over and over. I eventually want a model of every genre on my shelf. I hope to see some more "out of normal" models from you B !